With the upcoming TV show and John Cusack movie, it's safe to say Poe fever will soon be taking hold. In light of this, it's probably also safe to say this sweet little ring by Massachusetts-based literaryluxe (a.k.a. Jessica Furtado) won't be a mere $7 for long. If you go a bit "nevermore!" 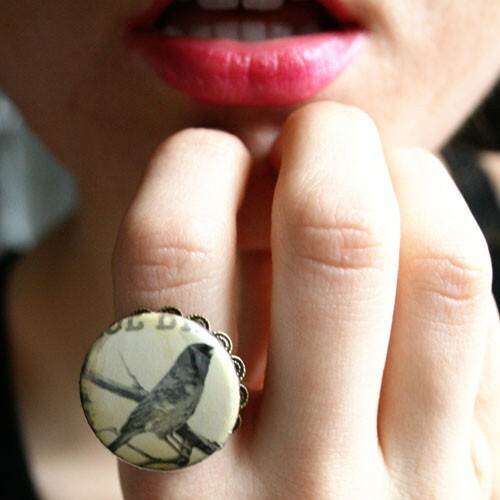 at the thought of raven bling, though, literaryluxe has a selection of other book-themed rings, as well as whimsical pendants, brooches and even stationery. Browse the Etsy goodness here and her website here. A friend came up with this brilliance: Poe + Diane Court = love-4-evermore And now I need to make a cross stitch sampler of it. I love the sound of that - send me a photo if you end up making one! That is so neat. I love bookish jewelry!